There is a $10/night pet fee. Pets should never be left unattended in the cottages unless confined to a crate. Pets are not allowed on any furnishings in the units. Pets must be kept restrained when in the vicinity of the cottages. YOU MUST CLEAN UP AFTER YOUR PET. Bagged waste may be disposed of directly in the dumpster. 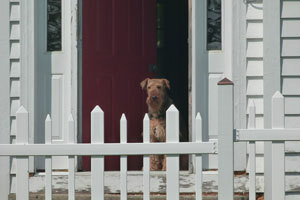 We do realize that your dog may bark at times but please be courteous of our other guests. There are several local kennels and daycares where you can board your dog if necessary. You are responsible for any damage that your pet may cause. We are also dog owners and realize how difficult it can be to find clean comfortable accommodations when traveling with a pet. We pride ourselves on the cleanliness of all our units as well as the grounds. Thank you in advance for your co-operation.